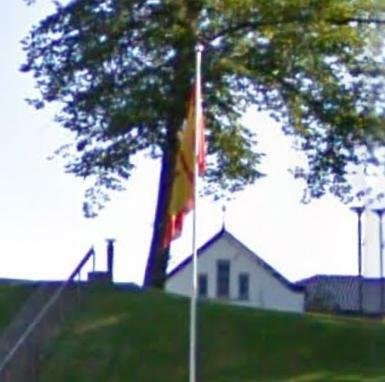 Here is flag and coat of arms of Fredrikstad. The blazon is: På rød bunn en oppreist gull bjørn foran en gull borg. In English: Gules a bear rampant or to dexter of a fortress also or. This was approved by the royal resolution of 21 April 1967 after a drawing by Hallvard Trætteberg. The design is based on the oldest know city seal of 1610 - depicting a three towered fortress behind a embattled wall with three windows with cannons sticking out of them and a gate - on a bridge leading to it over a moat standing a bear rampant. There was no fortress in Fredrikstand at the time and the teory is that the seal is based on a similar seal of Sarpsborg - the exiled from there were among the people who established in the city in 1567. Nevertheless the seal remained in use, and even after a fortress was buit, up until modern times. In the 19th century it started to be used in a shield shape, but it was properly heraldized for the 400-years celebrations in 1967 - retaining the visual link with the new Sarpborgs coat of arms as well. All of this based on [c2j87], of course.